Swift and Kotlin have taken the developer community by storm, helping to increase the number of developers for both platforms. Both languages rapidly gained adoption due to their easy syntax, simple way of writing and the modern techniques and features they bring to the table. Swift first appeared in June 2, 2014, and was developed by Apple to work with the Cocoa Touch framework. It works on top of the LLVM, an open source collection of compilers and toolchains. Swift has been a part of Xcode since version 6 was released. Apple open sourced Swift on December 3, 2015. Swift can be mixed with Objective-C in projects, but is meant to replace Objective-C. Initially, Kotlin was developed by a group of developers from Saint Petersburg, Russia, working at the company JetBrains. Kotlin was publicly unveiled in 2011. Kotlin runs on the JVM and is designed to interoperate seamlessly with Java, and is meant as a replacement for Java. Google announced official support for Kotlin as a development language for Android in 2017. Kotlin rolled out with Android Studio 3.0 in October 2017. In this article, you will take a tour of Swift and Kotlin and how they compare. While there is no hands-on tutorial, reviewing these language elements will provide you a great overview that will expand your knowledge of both of these languages. This tutorial assumes you have a basic understanding of either Swift or Kotlin. Swift and Kotlin are incredibly similar to one another. If you’d like to try out any of the following code snippets below for yourself, you can do so using a web playground for Kotlin or an Xcode playground for Swift. In both languages, there is a concept of mutability and immutability. Mutable properties can be changed or re-assigned but immutable properties can’t change. val quote = "If you don't work smart, you will probably be replaced by an AI." let quote = "If you don't work smart, you will probably be replaced by an AI." So, as you can see above, the basic difference between declaring immutable properties in Kotlin and Swift are the val and let keywords. Data structures are an important part of any language. They are used to organize, store, and manipulate data. Arrays, linked lists, dictionaries or maps, classes and interfaces are all examples of data structures. In both Swift and Kotlin, arrays have a fixed type — i.e., an array could be a collection of strings, for example, but not a mixture of strings and integers. Note that, while the array above is mutable, you were able to assign it to a immutable variable using the val keyword – more on this later. Another Kotlin collection type, lists are similar to Swift’s array type. Lists can have a variable number of elements and can grow in size after declaration. A dictionary (Swift) or map (Kotlin) is a very useful data structure when it comes to storing distinct values. While dictionaries and maps by default can expand, in both Kotlin and Swift, you can define their capacity for improved performance. Functions are the essential building blocks of any codebase. They help organize the code in a manner that makes it readable and maintainable. The return type of a function is represented by a colon :. In Kotlin, all functions have a return type; if you don’t specify the return type, a special type Unit will be returned by default. In Kotlin, a default value can be assigned to a parameter. For instance, take the example of the above function. The return type of a function is represented by a ->. Additionally, the type of a function Swift infers when the function is not explicitly returning a value is a special type, Void, which is an empty tuple, written as (). Lambdas (Kotlin) and closures (Swift) are another useful building block in your coding arsenal. In essence, they are unnamed functions. They can be assigned to variables and passed around like any other value. The ability to treat functions as values is one of the functional programming aspects of Swift and Kotlin. Some common use cases for closures include handling asynchronous calls, for example, when making a network request and working with collections. The return type of a lambda is represented by a ->. For lambdas with only one parameter, and whose type can be inferred, Kotlin provides a placeholder object name it for the parameter, and the -> can be eliminated, leading to a more concise syntax. In Swift, the return type of a closure is also represented by a ->. Both Kotlin and Swift are “safe” languages in that values can never be null / nil by accident — the programmer needs to deliberately use a special type of variable that can either have a value or no value at a given time of an application cycle. In Swift, these are known as “optionals” and, in Kotlin, they are called “nullable.” In both languages, they are represented by a ? placed to right of the variable type. var authToken: String? = "some long string"
The syntax for declaring nullable in Kotlin and optional in Swift is exactly the same. The following are a few ways to properly handle an optional / nullable type. In the above piece of code, if id is equal to null, then userId will be assigned a value of -1. The Elvis operator ensures that you get a value out of the nullable no matter what, by providing a default value in case a null value is encountered. In the above example, using the Elvis operator means userId will equal either the value inside id, or -1 if id contains null. Unlike Swift, in Kotlin, there is no guard statement. However, you can use the Elvis operator to similar effect. Here, if the value in the safe cast fails, readyForParade is null and the function will return without further execution. Kotlin’s let function, when used in combination with the safe-call operator ?., provides a concise way to handle nullable expressions. Contrast the above code with the if let Swift statement in the next section. Swift introduced the nil-coalescing operator in Swift 3, which works more or less like Kotlin’s Elvis operator. Swift uses the guard statement to provide an early exit to code execution. It provides clarity over if let by checking for the condition you want rather than the one you don’t, and by keeping the bulk of your important code from being nested inside of an if block. Also, kind of approaching Kotlin’s smart cast mechanism, after a guard statement, any variables or constants that were assigned values using an optional binding as part of the condition are now available for the rest of the code block that the guard statement appears in. The guard statement requires a else condition which breaks out of the function. Note that this isn’t quite the same as Kotlin’s smart cast mechanism — in this example, you couldn’t have written userId.description as userId still needs to be accessed as an optional. Just as functions and closures are the building blocks of any app, if-else, switch, for loops and other types of control flow are the logical glue that enable applications to work. when is the name given to switch statements in Kotlin. Note that in Swift, a switch statement must be exhaustive. In other words, a default clause is required if every single possible value of the condition hasn’t been tested. This is not the case in Kotlin; so for switch statements Swift is actually more clear and less prone to programmer errors. On the other hand, the syntax for switch statements in Kotlin is more concise. In both languages, the statement returns as soon as the first matching condition is evaluated, so there is no need for a break statement. There are a number of ways of writing loops in Kotlin. In this example the .. specifies an inclusive range; the numbers 1 – 10 are printed. Both Kotlin and Swift provide a variety of different types of range operators. What are known as “constructors” in Kotlin are “initializers” in Swift. Kotlin also has an init block that is paired with a constructor. Class extensions are a cool feature adopted by modern languages. It helps in extending the functionality of existing classes. What is known as an interface in Kotlin, and other languages, is called a protocol in Swift. It helps you maintain a decoupled codebase, achieve polymorphism, and write mocks for testing. An interface / protocol can also have a default implementation. Default behavior remains the same whenever that function is called without being overridden. Assume you want the property canFly to be false in all conditions until or unless its required to change. These new languages come packed with powerful tools that enable you to write code using a functional paradigm. There are lots of tools provided by them, but have a look at just a few of them. map is used for transforming data into a new form. Consider a data class Person, containing properties name and date of birth. Note: In Kotlin a Data Class is similar to a class, but with the sole purpose of holding data. It makes your code more concise and you don’t have to write an initializer. Data classes are a powerful way in Kotlin to implement “value objects”. Say you want to get the names of all the persons into a separate list — that’s where you’ll use the map function to help you. compactMap is similar to the map function, but it returns all the non-nil objects. Instead of iterating through an array or list with a loop, the filter function can be used to filter for the desired values. 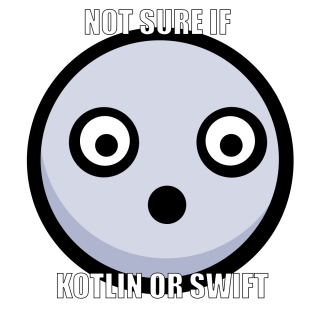 As you have seen, Swift and Kotlin are similar in many ways. However, they still have some differences. Swift has value types, such as structs, as well as reference types, while Kotlin only has reference types. Take a look at some examples. Now, consider the above Person class as a Swift struct. Other than not being able to re-assign the value, val and let do have a small difference in how they are handled across the two languages. The fundamental difference here is in the treatment of an array or list. Kotlin lets you append values to a mutable list even when it’s declared with a val. Similarly, you can declare an array in Kotlin using val and afterward re-assign members of the array using subscript notation. In contrast, in Swift, an array must be declared as mutable using var in order to have members updated with subscript notation or to append values to it. After reading this comparison between Swift and Kotlin, you must have gotten a pretty good idea of how much they have in common. Both of these languages are not limited to mobile development, either. They both are used for server side development and cross-platform app development as well. To serve this purpose there are a number of frameworks out there to help you with it. Vapor and Kitura are used for server side Swift and video courses on these can be found on our website. For Kotlin there is Spring Boot. For cross-platform app development there are frameworks like Kotlin-Native and Scade. If you have any questions or comments, please let us know in the discussion below! 5 best Russian to English dictionaries and phrasebooks for Android!